With well over 100 years of automotive experience, we build relationships through education and consultation to maximize our customers' investment. 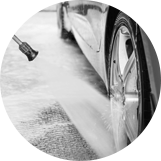 At Genuine Car Care Center, we provide top of the line auto care with the value that comes from independent shops. Check out our best-selling , top brand, tires, including MICHELIN®, BFGoodrich®, and Uniroyal®. We provide a wide array of automotive services for your vehicles; everything from brake repair, to Engine diagnostics, to preventive maintenance, and more! Stop by today to see what Genuine Car Care Center can do for your vehicle. We are a locally owned business on a mission; a mission to help your vehicle operate at its best in order to maximize your automotive investment. For over ten years, we've built our platform on the idea that you can Experience the Genuine Difference with our ASA, ASE, NAPA, and TIA certified team working on your vehicle, and repairing it to the highest possible standard. We offer a large selection of top of the line tire brands, tire services, and automotive repair services, all conveniently located in a one stop shop! If you are near Kernersville, NC, Winston-Salem, NC, Oak Ridge, NC or surrounding areas, stop by today and see for yourself just how easy car repair can be!